The Staffordshire Bull Terrier, or Staffie as it is sometimes affectionately called, is an English breed that should not be mistaken for its larger American relative, the American Staffordshire Terrier, though both breeds are often referred to as Pitt Bulls in the press and elsewhere. Every part of the Staffordshire should convey power and athleticism. Strong for their size, these animals have a stocky muscular build and are surprisingly agile. A short muscular neck should be in proportion with the close-coupled well defined body. Forelegs are set wide apart to allow for a deep chest. The head is broad with a slightly foreshortened muzzle and strong jaws, and the eyes have a bold and energetic expression. Darker coloration of the eyes and nose is preferred in the breed standard. This terrier has rose or half pricked ears as well as a straight low set tail, neither of which should ever be cropped or docked. The coat is very short and smooth. Accepted colors are red, fawn, black, white, brindle, and blue or any one of these colors with white. 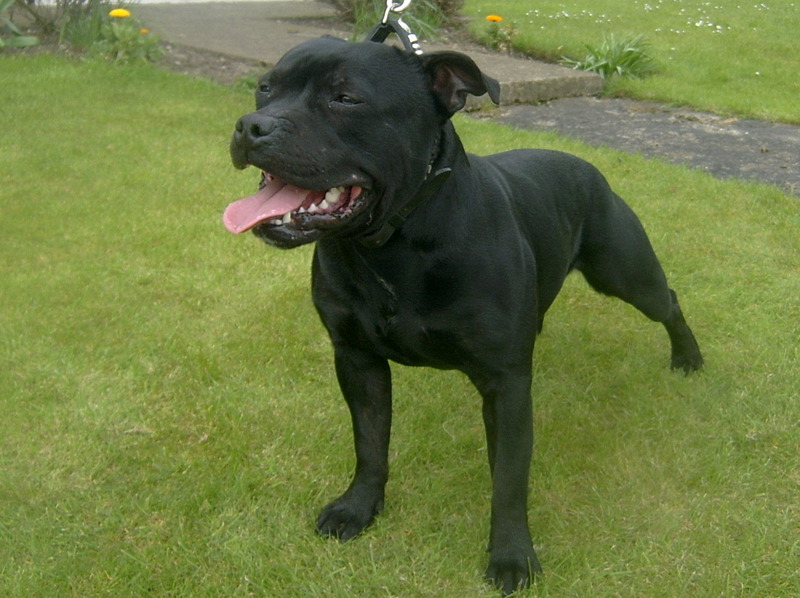 Height (Male) 14 - 16"
Common Misspellings Staferdshire Bullterrier, Stafordshire Bull Terrier, Stafferdshire Bull Terrier or Staffordshire Bull Terier. Highly affectionate and loyal to their owners, Staffords are also welcoming to new people. Their intelligence and energy make these animals great candidates for obedience and agility work. Though most modern day Staffordshire Bull Terriers are far removed from their days as canine gladiators, it is still part of their genetic makeup. These terriers also tend to have a high prey drive towards small animals. Both of these tendencies can be kept in check through extensive socialization and consistent obedience training. Spaying or neutering will also help cut down aggression levels towards people and other animals. Affectionate, playful and gentle with children, the Sttaffie makes a great family pet. A long walk once a day is sufficient though of course they will welcome more. Due to their shortened muzzle Staffies can be susceptible to overheating so care must be taken on hot days. Young puppies must be given chew toys and trained not to chew on furniture and household objects as their strong jaws can be destructive. When it comes to grooming The Staffordshire is a low maintenance pet. A Staffordshires short coat will rarely need to be brushed and only occasionally needs to be washed. Because of the strong attachments these dogs form they should be allowed to live indoors with their people. One concern for potential owners of this breed is the negative media hysteria that has been focused on so called Pit Bulls in the last decade. Staffordshire Bull Terriers have been lumped together with their American relatives, who tend to be a bit more dangerous, and in some areas these breeds have been banned. This is why it is so imperative for owners to properly train their dogs and help combat the negative stereotype. A very healthy breed, the Staffordshire Bull Terrier may develop canine hip dysplasia, L-2-hydroxyglutaric aciduria and hereditary cataracts other illnesses are very uncommon. The larger bulldog and mastiff had been used for bull baiting in England but as that sport declined in popularity dogfights became more common. This created the need for a smaller and more agile dog. Bulldogs were bred down in size and eventually a cross between these smaller dogs and the Black and Tan Terrier created the Staffordshire Bull Terrier. These dogs were known for their courage and gameness in the ring but they were also bred to be loyal and affectionate toward their handlers. Dog fighting eventually began to lose its popularity and was outlawed in 1835. The Staffordshire Bull Terrier remained in favor with working class families, however, and soon after the ban on dog fighting a group of workers in the Staffordshire area attempted to preserve the breed by introducing it into the world of dog shows. These very same men would eventually write up the breed standard and give the dog its name. The breed was officially introduced to the Kennel Club in England in 1935, and was accepted into the American Kennel club in 1974. Today the Staffordshire Bull Terrier is known as a stable, playful family companion and is the 5th most popular dog in the UK with 18 breed clubs in Great Britain and Northern Ireland. In the UK, its kind and motherly temperament toward children has earned it the nickname Nanny Dog.